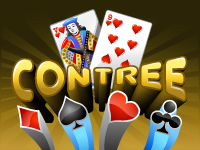 Contree is a variant of belote. All the cards are dealt, teams then bid, the highest bid is the target. The first team to achieve the number of points set at the beginning of the game wins.